Mountain lion Pecos was born in 2004, and was a young adult cat when he was found beneath a car, emaciated and starving. Arizona Game and Fish took him in before bringing him to Southwest Wildlife for care. Pecos is a shy, wild-acting mountain lion. 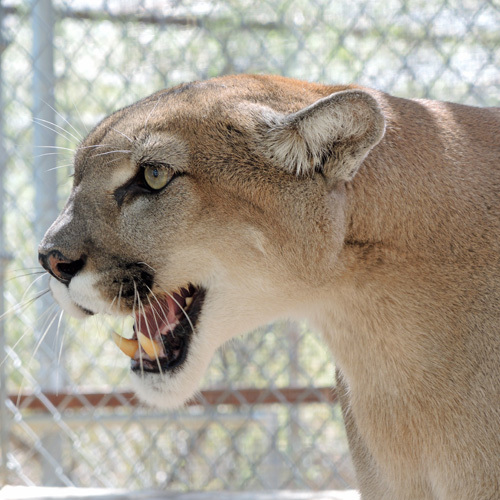 Until recently, he has lived in an off-display enclosure with Kino, another male mountain lion. He now has access to his enclosure and to the enclosure where Ash and Giselle live. Pecos preferred his privacy in the past, but is now spending time up near the front where he can watch the happenings at the sanctuary throughout the day. We’re pleased that he’s having new experiences! It’s never too late to learn something new, even if you’re a mountain lion!